Although it is rooted in history, the Cathedral is not a museum but a vibrant, living community which depends on the goodwill and generosity of the many volunteers who work alongside the Clergy and Staff every day and in many ways. From the shop to stewarding, flower arranging to bell ringing, singing in the Parish Choir to leading the Sunday School, there are many opportunities to get involved and contribute in a positive and precious way to the life of the Cathedral Community. 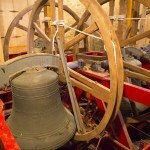 The Jasper Tower has been the home of the Cathedral bells for more than 400 years and now contains a modern ring of 12 bells, installed in 1992.All our bell ringers are volunteers, ranging in age from 10 to over 80 and come from all walks of life. 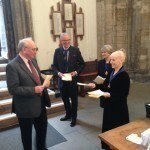 We ring for Sunday services and for special occasions such as ordinations and civic events and we practise on Tuesday evenings. Our ringing extends throughout the diocese where we enjoy meeting friends from other towers for regular practices, social occasions and ringing outings. Guides and Welcomers are a team of volunteers who provide a warm welcome and offer historical information and insight into the fabric and life of the Cathedral. They are given full training and thanks to the generous contribution of Arthur Impey, John Bethell and Revd Roger Dixon who give of their expertise in the training programmes. The Cathedral also has many school visits, arranged by a team who are experienced in working with children. 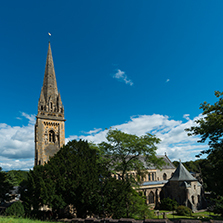 The Guild continues to maintain the high standard that it has always set itself, and it was good to hear more than once in the past twelve months that the standard of serving in Llandaff is considered to be amongst the best in any British Cathedral. Teams of Servers continue to play a role in all the Sunday morning services and during the week, as well as at special services such as Ordinations and other services where the Bishop is present. Under the guidance of the Dean, the servers continue to train to meet adjustments to the Sunday services, and hold an ‘INSET’ day once a year with the Dean and Virgers. The M.U here has been established over 100 years and our particular concerns are for the wellbeing of our members and their families and for families worldwide. We have 64 members, seven of which are Indoor Members who through frailty or advancing years are unable to attend our meetings. We try to keep in touch with them by visits, cards and a Christmas gift each year. We have a varied programme of talks on a fortnightly basis with a break in August. We enjoy at least one lunch and an outing each year. 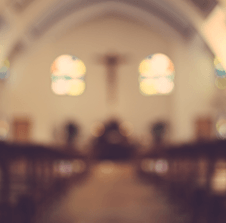 Prayers are said at every meeting and we hold several Eucharists, a Quiet Morning and an Advent Service each year as well as attending similar Diocesan events. From time to time we are also known to provide a first rate afternoon tea! New members are always welcome or visitors who have an interest in some part of our programme. 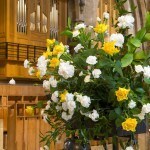 Llandaff Cathedral Flower Guild is responsible for all floral arrangements and displays in the Cathedral throughout the year. The Guild has a membership of 65 with all levels of flower arranging skills – from very experienced to beginners. New members are always welcome whatever your experience and skills and can work alongside more experienced Guild members (we’d love some men to join the Guild too). Demonstrations are held and mentors are available for the less experienced who would like guidance. Teams of 5 or 6 arrangers have the opportunity to prepare displays throughout the Cathedral for perhaps 2 – 3 weeks per year, as well as volunteering for the festivals of Easter, Harvest and Christmas and other important events held throughout the year. 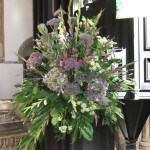 Being a member of the Guild provides an opportunity to prepare much larger floral displays than one would at home, contributing to and enhancing the beauty of the Cathedral. Please contact Mrs Philippa Hallinan on 02920 844072 or l.hallinan@ntlworld.com to join the Flower Guild or for more information. The group meets on a Tuesday morning (9.30am to 12 noon), in Prebendal House. Work continues on making new kneelers, and repairing damaged ones. 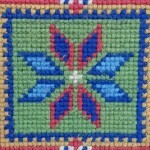 Members also make other items, such as Altar Linen, Collection Purses and other repairs. Our main fundraising event is an annual Coffee Morning. Donations are also made to the group. Money raised funds the purchase of wool, canvas, and other materials required to complete our projects. Tea, coffee and biscuits are always available. 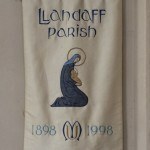 Parish and outside organisations use the Parish Hall, situated between Llandaff Car Park and Chapel Street, either on a regular (eg weekly or monthly) or an occasional basis. The Hall can accommodate up to 70 people sitting in rows to hear a speaker, or up to 50 for other occasions such as classes and groups. The Chapel Street entrance provides disabled access. There is a small kitchen which is suitable for providing teas and coffees and cold food, but not for anything more elaborate. The Cathedral Parents and Toddlers group meets every Wednesday during school term times at the Parish Hall from 9.00-11.00am.It is an informal group and an opportunity for parents and children from the community to get together. 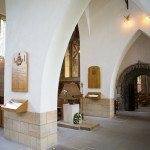 The Llandaff Cathedral Sunday School meets in Prebendal House at 9.00am every Sunday in term time. More than 100 children can attend on a busy Sunday but average attendance is between 70 and 80. The children are grouped by age with every ‘class’ having at least two adult ‘teachers’ present. A dozen adult leaders cover the sessions as well as a number of teenage helpers who participate as part of the Duke of Edinburgh Award. It is a supportive team working in a relaxed, welcoming environment. 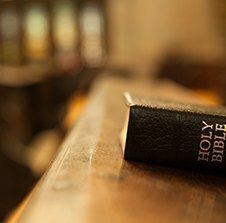 A typical Sunday School class would include listening to a Bible story and discussing it or completing an activity on the theme from the story; this might involve art or collage work which can then be taken home or displayed in Prebendal House. Sometimes the older children do drama – acting out a story to get the best possible understanding. 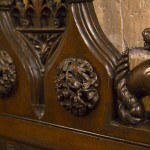 Two or three children always provide ‘feedback’ to the whole congregation from the lectern at the end of the Service. If you would like more information about how to get involved with the Sunday School or for your child/children to join, please contact the Cathedral Office. 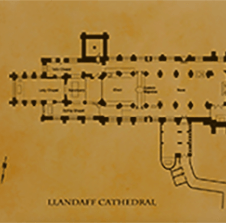 The Cathedral shop can be found to the right of the West Door, beneath the Pritchard Tower. 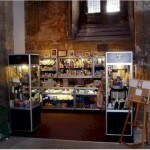 A group of approximately 60 faithful volunteers keep the Cathedral shop open from 10.00-4.00pm six days a week, throughout the year. 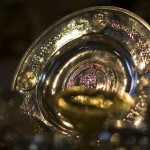 During Advent and Lent the shop is open after the services on a Sunday. As well as helping to raise income for the Cathedral, the shop team also welcome visitors and of course advise on a suitable choice of gifts. The shop stocks cards for most occasions – including of course Baptisms, Weddings and Confirmations; as well as postcards, souvenir gifts and a wide array of religious books, bibles and more general literature. 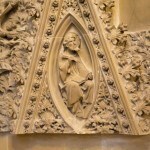 Books about the Cathedral and its life can also be found here.